The concept of modern motherhood varies for different women, but the common denominator has always been work. The working mother is a force to be reckoned with; often with BlackBerry in hand, she is a woman constantly on the move, struggling to balance the persistent demands of life and love, career and family. But what about the woman who has chosen to take work out of the equation to focus largely on caring for her children at home? Where does she fit into the situation, especially when she's black? If last month's "mommy wars" — ignited by Democratic strategist Hilary Rosen's comments about Ann Romney — are any indicator, being a stay-at-home mom has gotten a bad rap. "There is a stigma around being a stay-at-home mother because unfortunately, many people do not attach the same degree of value to our role as they would a mother who works," says Kuae Mattox, national president of Mocha Moms, a support group for black stay-at-home mothers, and a mother of three. "The fact of the matter is that both stay-at-home and working mothers work. The only real difference is in the dollar sign and the value that is placed upon our work." Darcel Harmon — a mother of two daughters, 7 and 5, and one 2-year-old son — blogs about being a stay-at-home mom at the Mahogany Way. She goes so far as to say that mothering has no value in American society. "It's because women can work and vote now," she explains. "We can do all that men do … and sometimes we do it better. Why in the world would we want to stay home?" The stakes may be higher for black stay-at-home moms. They occupy a unique space where varying factors — feminism, "traditional" African-American family dynamics, race and class — seem to be in direct conflict with their decision. According to recent reports, black women are half as likely as white women to stay at home with their children, a truth that highlights a series of inequalities in African-American history. Historically, many black women haven't been afforded the option of not having to work. It was "necessary for survival in the U.S. societal context that does not allow a 'breadwinning' wage for black men," writes Riché Daniel Barnes, associate professor of anthropology at Smith College. Even today, the unemployment rate for black women is 10.8 percent, compared with a slightly higher 13.6 percent rate for men. The need for black women to be breadwinners (along with the separation caused by slavery) has been referenced as being responsible for the fractured black family, in which women are in charge and men are shadowy — if not altogether absent — presences. Whereas a white stay-at-home mom is often assumed to be married, black stay-at-home moms have to deal with the "welfare mom" stigma. "Many in white America still aren't even aware that two-parent African-American families exist in which the mother has made the choice to stay at home," Mattox says. Thanks to increased access to education, more black women have moved away from jobs as domestics and into higher-earning careers. Which is why, Mattox says, the idea of staying home to watch Junior can be viewed as "throwing it all away" in the African-American community. "The path to success in the black community has almost always been through economic empowerment," Mattox adds. "So to stay at home is really going against the grain. It is seen by some as an affront to our race — that our ancestors fought so hard for us to have equal rights, and we have gone and turned the clock back." Black stay-at-home moms often also face an internal struggle over their decision, according to the Mahogany Way's Harmon. "We're taught early on to be independent, that we have to claw our way to the top," she explains. "How can we be independent if we're staying home with the kids? What are we proving to society by going back to doing what we were emancipated from?" "What is more at odds for educated black women is reconciling the expectation that they will work outside the home alongside a growing feeling that they shouldn't," Barnes says. "The expectation has been that they would make a contribution to their own families and that of the entire black community." Despite these socioeconomic factors, making the decision to become a stay-at-home mother is far from throwing it all away, Mattox maintains. Many moms in her organization do more than just bake brownies and go to PTA meetings. They're community leaders or part-time employees or running home-based businesses. "The term 'stay at home' is a complete misnomer and implies some sort of passivity, whereas the moms that I know are anything but passive," Mattox says. 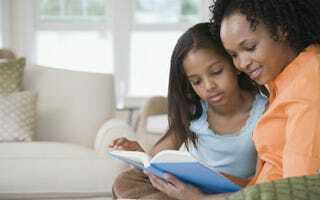 Being a stay-at-home mom also means taking a conscious step toward improving your children's lives. "I decided to become a stay-at-home mother because I wanted to focus on raising my children. I wanted to see to it that my children have all the tools that they need to survive in this uncertain world," Mattox says, noting that for her, it was also financially possible. "My mother was able to stay at home for about a year after I was born. I remember her being so proud that she had that opportunity." Harmon says that her daughters understand that black mothers should have a choice. But, she adds, "They have said on more than one occasion how much they love me being with them every day." Anthonia Akitunde is a contributor to The Root.